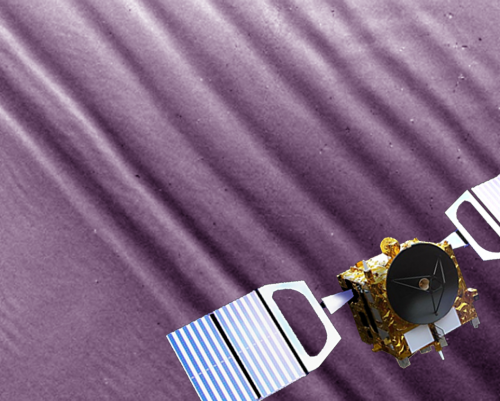 Venus Express probe on a real image of Venus atmospheric waves. Venus is a slowly rotating planet since it takes about two hundred and forty three terrestrial days to complete a round about itself. Its atmosphere is expected to rotate with the same rhythm as well, but in the case of Venus it takes only four days. The origin and motor of this superrotation is so far unknown, but the numerous waves present in the planet's atmosphere may play an important role. A study has just identified the nature of these waves for the first time. "Venus is a mind bender for specialists in atmospheric dynamics. Its winds reach velocities higher than four hundred kilometers per hour, seventy times faster than the rotation of the planet. The fastest winds on Earth, to give one an idea, are far below that mark", says Javier Peralta, researcher at the Institute of Astrophysics of Andalusia (IAA-CSIC) who is leading the study, "But after thirty years of research, we still lack a physical model that can faithfully reproduce the superrotation of Venus", he says. Atmospheric waves display an extraordinary activity and variety, and they are key to describing the circulation on the atmosphere of Venus, but their nature and properties remain unknown. This is mostly due to the fact that the dynamics of Venus' atmosphere is radically different from planets with higher rotation velocities such as Mars or the Earth: while wind plays a predominant role in the equilibrium of atmospheric pressure of the former, in the latter two the dominant factor is rotation. "We have for the first time solved the equations describing the movement of the atmospheric waves particular to Venus, which in turn has allowed us to identify the nature of the waves observed by the Venus Express mission", says Javier Peralta (IAA-CSIC). The study, which has classified six different types of waves and has predicted their characteristics, provides a new systematic tool to classify waves. Henceforth it will be possible to assess their role in transporting, creating and dissipating the atmosphere's energy. "Some of the waves we have found, such as the acoustic waves or the gravity waves, have properties almost identical to those on Earth," says Javier Peralta (IAA-CSIC)-. "Other types of waves, however, do not exist on our planet, like the ones we have called centrifugal waves and are responsible for the two hundred and fifty five day oscillations displayed by the winds of Venus". This study will allow a profound study of the waves not only on Venus' atmosphere, but also on that of Titan, the biggest of Saturn's moons, which also has a superrotating atmosphere. Likewise, the conclusions of the research apply to many planets around other stars which, according to available data, may also display superrotation. 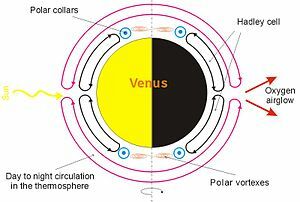 Planets are like Faraday motors, electrical energy from space deposited in the upper atmosphere hence super rotation and Venusian polar vortex. Thirty years scratching their heads tied to flawed models of how the solar system works. IMO this rotation is powered with convective gradient of atmosphere itself. The atmosphere of Venus just forms two giant convective cells. Which gets particularly funny at the Venus poles, where whole this circulation concentrates and changes direction in two bizarrely huge tornadoes, which resemble the sink vortex. This circulation would represent a problem for occasional colonization of Venus in future. The atmosphere of Venus is very dense and even the mild speed 25 mph would act like the hurricane there.